Westhoughton Road Winding Hole is a minor waterways place minor waterways place place on the waterways major waterways place village town city on the Leeds and Liverpool Canal (Main Line - Wigan to Leeds) between Wigan Top Lock Junction (5 miles and 4¼ furlongs to the south) and Walton Summit Branch Junction (The branch is the original route of Lancaster Canal) (3 miles and 5½ furlongs to the north). 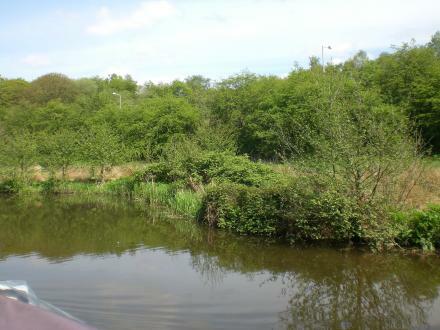 The nearest place in the direction of Wigan Top Lock Junction is Ellerbeck Narrowboats Wharf; 1½ furlongs away. The nearest place in the direction of Walton Summit Branch Junction is Idle Bridge No 72; ½ furlongs away. 23 Church St, Chorley, PR7 4EX — 1516 yards to the south. 32 Chorley Road, Chorley, PR6 9 — 557 yards to the southeast. 20 Church Street, Chorley, PR7 4EX — 1633 yards to the south. Bolton Road Adlington, Chorley, PR6 9NH — 1463 yards to the southeast. 166 Chorley Road, Chorley, PR6 9LQ — 1371 yards to the southeast. 119 Railway Road, Chorley, PR6 9QX — 1440 yards to the southeast. The Boatyard, Rawlinson Lane, Heath Charnock, Chorley, PR7 4DE — 386 yards to the south. Lancaster, LA11US — 805 yards to the southeast. duxbury hall road, Chorley, PR7 4 — 1170 yards to the northwest. Railway Road,, Adlington — 1486 yards to the southeast. 2 Bolton Road, Preston, PR6 9NR — 1476 yards to the southeast. Derbyshires Farm, Chorley, PR6 9EF — 1590 yards to the northeast. Eaves Green Community Centre, Cottage Fields, Chorley, PR7 3QG — 1428 yards to the southeast. 117 Railway Road, Chorley, PR6 9QX — 1438 yards to the southeast. Railway Road, Chorley, PR6 9QX — 1444 yards to the southeast. Chorley, PR69LP — 1467 yards to the southeast. Brooke Mill, Brooke Street,, Preston, PR6 9LE — 810 yards to the southeast. Lower Adlington, Chorley — 1488 yards to the southeast. 46 Church Street, Chorley, PR7 4EX — 1517 yards to the south. Farm Avenue, Chorley, PR6 9ND — 844 yards to the southeast. 19 Church Street, Chorley, PR7 4EX — 1556 yards to the south. Bolton Rd, Chorley, WN1 1 — 890 yards to the north. Railway Road, Chorley, PR6 9QZ — 1402 yards to the southeast. 122 Railway Road, Chorley, PR6 9QT — 1441 yards to the southeast. Chorley Golf Club, Chorley, PR6 9HX — 1468 yards to the southeast. 47 Belmont Road, Adlington, PR6 9PU — 920 yards to the southeast. 164 Chorley Road, Chorley, PR69LQ — 1366 yards to the southeast. Adlington, PR6 — 1434 yards to the southeast. 9 Lancaster Place, Adlington, PR69SG — 1053 yards to the southeast. Adlington, Chorley — 1488 yards to the southeast. Long Lane, Chorley, PR6 9EQ — 1512 yards to the northeast. Granville St, Chorley, PR6 9PY — 1520 yards to the southeast. Grove Crescent, Adlington, PR6 9RJ — 1440 yards to the southeast. White Bear Marina, Chorley — 1488 yards to the southeast. The Old Infant School St Paul's, Adlington, PR6 9QZ — 1392 yards to the southeast. Railway Road, Chorley, PR6 9QZ — 1482 yards to the southeast. Hall o' th' Hill, Heath Charnock, Chorley, PR69 — 854 yards to the northeast. 903 yards to the south.